Over 35 years of Family Law experience, excellence and value. Velos & Velos Family Lawyers are highly respected and its founder and staff all strive to provide expertise, value and excellence in representing their local, interstate and international clients to achieve their goals and for a better world community. Talk to us today about how we can help you create a fair and enforceable binding financial agreement. If you need advice regarding a new or existing child-support agreement, talk to us today about your options. With this less adversarial approach, we can help you negotiate, come to an arrangement and to put in place measures to ensure that this arrangement is kept. We can help you to find your way through these complex proceedings, and to ensure an appropriate outcome. Do you have other legal issues? Talk to us today, we can help. Working with John Velos and his team has meant that much of this stress has been lessened and that whilst my files have been in his capable hands, I have been able to spend more of my focus on my children (who require much supervision and care) and my health which is of great concern. We engaged Mr John Velos and his team with an issue where my wife, Wendy Lam and I were wronged by our wedding reception. John and his legal team were genuinely sympathetic about our situation and fought for us with real compassion. My son engaged John Velos Lawyers in 2017. He had been charged by Victorian Police with some very serious allegations which I believe affected him to the point where he was unable to process the consequences to be able to make good choices or decisions. Except of course, for finding Velos & Velos Lawyers…how my son managed this is a miracle in itself! It has been an extremely difficult time for our son and I cannot stress how much I have appreciated John’s years of professional wisdom and counsel. I reside in Perth which added to the despair and distress. 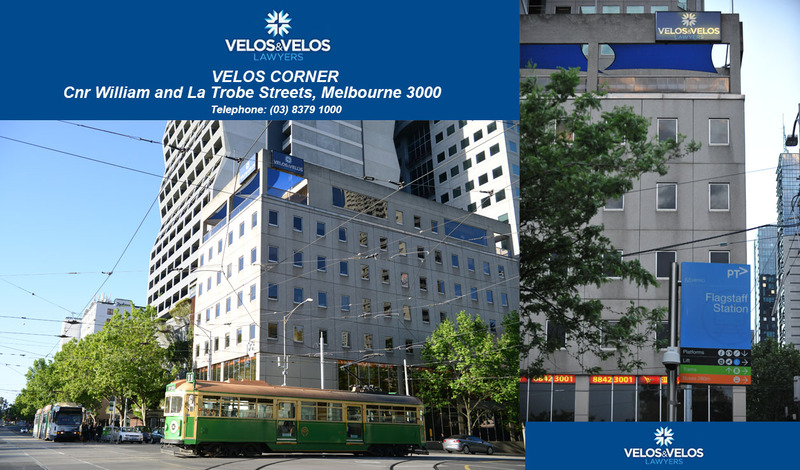 Velos & Velos Family Lawyers, A Division of Velos & Velos Lawyers and can be found on the 6th floor, 326 William Street, Melbourne corner of Latrobe Street and William Street on the North East corner opposite Flagstaff Gardens and Flagstaff Station which is easily accessible and reached through the Victoria wide and Melbourne wide rail network. Further, our offices are very close to all the Courts and are easily accessed by the Melbourne tram network. This landmark corner of the Melbourne legal precinct houses Velos & Velos Lawyers – a firm of professional, experienced lawyers, guaranteeing you affordable legal service excellence!